If you are looking for an easy Easter game that you can easily make, check out this printable Don’t Eat the Peep game create by Mique from Thirty Handmade Days. This is a silly Easter game that young kids especially will get a kick out of. The rules of the game are simple and it is fast paced and even funny. Best of all, kids get to eat the candies, pretzels, or whatever you decide to use for the game pieces. 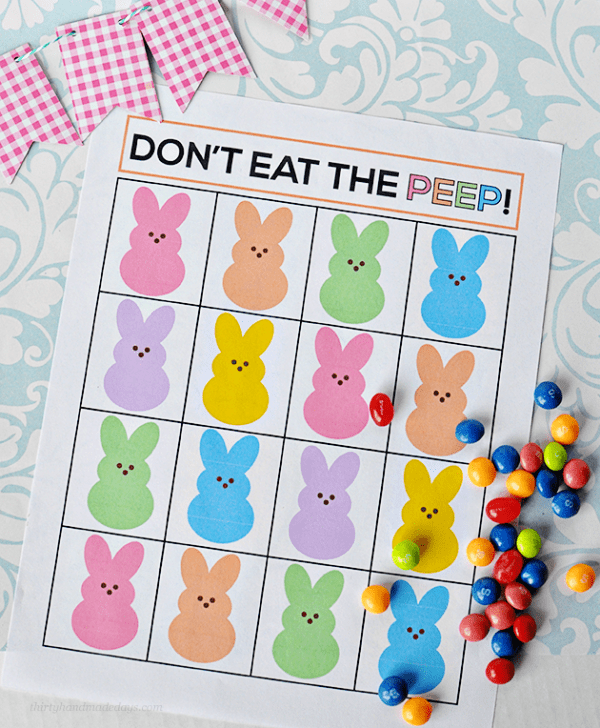 Print out and make your own Don’t Eat the Peep Easter Game. Feeling particularly dense about the directions: one kid leaves the room, everyone else puts candy on the board, the kids comes in and eats one piece of candy at a time while everyone yells, “Don’t eat the peep”? What step am I missing? Place small candy on each Peep. One person is chosen to be it and leaves the room and the others all decide which Peep is the one that can’t be eaten… When the person who is it returns, they eat the candy off of one Peep at a time until they touch the candy on the Peep that everyone selected while they were out of the room. Once they touch that candy, everyone yells “Don’t Eat the Peep” and that person’s turn is over. Choose someone else to be it and continue this until everyone gets a turn.